Despite a large percentage of the active population either leaving the State due to other private concerns or due to the independence of Volfa, nearly 80$USD have been donated to charity by Sandum citizens. From causes ranging from the Human Rights Campaign — a foundation fighting for the acceptance, rights, and equality of the LGBTQ community — to Kunzang Palyul Chöling — a Tibetan Buddhist temple in Maryland struggling to keep its doors open after almost 30 years –, the State of Sandus through its kind-hearted citizens have donated a tremendous amount of money. The Sandum Philosophy speaks clearly on the nature of suffering — that it arises from desire, ego, fear, hatred, and ignorance. Compassion, on the other hand, enlightens one on all of those causes: it alleviates desire, it makes one altruistic and without ego, and it connects one to others (even those they may have formerly disdained) and thus alleviating the latter three. When it comes to the course of Sandum Philosophy, Socialism in Sandus enables our citizens to be more compassionate and to build a better world and a better Nation-State by our own work. Although 80$ is not a tremendous amount of money, for a micronation composed of young adults and of a population that has been reduced, it is proportionally — and with all circumstances willing — a grand amount. May we perpetuate the strength of our Nation and hold firm the Philosophy by good-will! Three grand projects are planned for this Summer to date. The first will come in the next few days: the creation of the State’s first horticultural cooperative. Next, over the course of months, the State of Sandus and the Kingdom of Überstadt shall be working together to draft a code of laws that shall be suitable — for the most part — to both states and, where not suitable, shall adopt two versions of the same text to reflect both states’ national laws. Finally, around August, the Sôgmô’s research on Lycurgan Sparta shall be published. It has long been planned that when work for the 2015 Economic Goal, shared between Sandus and Renasia, would finally begin that Sandus would begin at the very start of human history: at the Neolithic Period. Of course, we do not inhabit this time period, so that the Neolithic Revolution will happen when the first seeds are sewn and not over thousands of years, but the importance of this is critical. Symbolically meaning that Sandus is starting over its society, culture, political system, and economics from scratch, this move also establishes a key importance of Sandum culture in establishing a humble people dedicated to their crops. It is very Sandum to be humble in our lives and in our State affairs, but this shall now be extended to our start-up economy as the first horticultural cooperative shall be dedicated to making “Fresh Food from Small Spaces” (the title of the guide we shall be using for the cooperative). Our cultural ideal of Anticosti, as well, stresses this agrarian and humble lifestyle. With plans such as the All-Citizens United plan, the creation of this cooperative will work to commence the building of both our Socialist system and our Socialist economy, for the welfare of our People and for others. The code of laws is, in effect, legal reform. In March 2012, it was decided that no more laws would be enacted by the Office of the Sôgmô. These laws were long, complex, and thought-out documents which took many hours or days to complete. They were time consuming and, as a result, it was thought better to establish a system ruled by unworded decrees from the Office of the Sôgmô. Indeed this very Spartan concept (as it was forbidden for Spartan law to be written, only spoken) has transformed our way of thinking but, for all purposes, we must recognise the importance of written law upon our age and in a State with citizens as broad as ours. The code of laws will establish for Sandus new laws, concerning the running of the State and the relationships between the People and so forth, and will establish — as working off the example of Justinian’s Corpus Iuris Civilis — a system by which further laws can be enacted and published for all citizens. The Sôgmô’s research on Sparta was inspired by a BBC documentary on the same people. Having researched the infamous law-giver of Sparta, Lycurgus, and the system itself, the Sôgmô is preparing to present two separate papers on the subject: one intended for Sandus and the other of a general academic nature. Contesting the contemporary view that Sparta was just a militaristic state, the Sôgmô wishes to explain how the example of Sparta, a city-state so focused on good order and the common good, is beneficial to Sandus. Whilst scorning the helotisation of the Messenians and the militarisation of the Spartiates, the Sôgmô wishes to explain in context how the Spartan rhetra constitution is not so different from the Sandum Philosophy in wanting to ensure a good ordered state. Sparta, just like Sandus, ran on a dual-definition basis: it had a monarchy and yet also had democracy. Lyrcurgus’s work in establishing what it called “the central ballast” of state for Sparta ended up working and saving Sparta from the demise other Laconian city-states suffered from the same issue; Lycurgus’s work in establishing this ballast and also the hallmarks of a state such as Sparta is both compelling and necessary to study on a comparative view of both Sandus and Sparta. The Emblem of the Most Honourable Order of the Throne of Sandus. In concerns of the Most Honourable Order of the Throne of Sandus, we must first announce a change to prior convention. Following the upcoming awarding, the Order shall no longer be awarded as an obligation by the Office of the Sôgmô upon Equinoxes and Solstices. Instead the Order shall be awarded on Solstices and Equinoxes when necessity warrants it. This means that there may be some Solstices and some Equinoxes when the Order is no longer awarded, unlike the prior convention where it was necessary to award the Order each Solstice and each Equinox. The person being awarded the Most Honourable Order of the Throne of Sandus has long been a quiet and pensive ally to our State. He has striven for understanding the Sandum Philosophy and the Sandum Political Theories and has granted, on several occasions, sound advice for the benefit of our Nation. When he has disagreed with our Philosophy or our Political Theories, he has expressed them in a courteous manner and recognised the Sandum sovereign right to keep them for their own. Not an ally with which the State communicates at a common rate, unlike our allies of Renasia and Austenasia, this King has proven his friendship and loyalty to Sandus by being the calm advisor at times of conflict and being the level-headed King with which the Sôgmô has found a confidant. Most recently, he has been helpful in helping the Office of the Sôgmô consider legal reform that has been discussed above in this report and which has become an important project for the State this summer. King Adam of Überstadt has been awarded the Most Honourable Order of the Throne of Sandus for his generous work in helping the Central People’s Government in various fields of work. Congratulations! 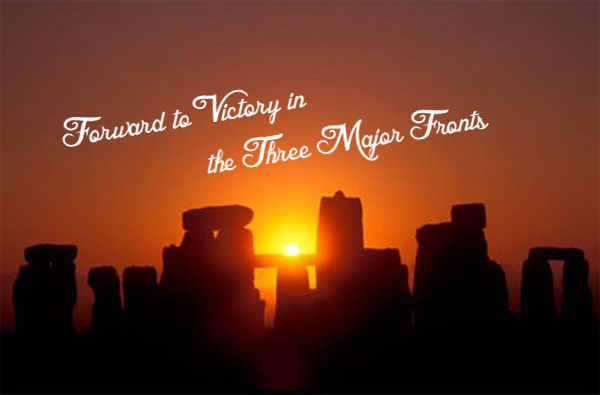 Let us strengthen our State this Solstice and this Summer!